View from the top of the bluff at Laguna Beach. It’s been a very looooong time since I’ve posted food that I made for Bebe E. One of the reasons why I rarely post my homemade baby food is because it’s basically pureed organic fruits or veggies and honestly, it’s pretty boring stuff. Over the past several months, however, I’ve been taking photos of the food I made for Bebe E, thinking that one day I would write about it. In order to make Bebe E’s pureed food more interesting, with every homemade baby food that I post, I will start by sharing with you one of our outings or an event! Doesn’t that sound exciting! (Ok, I know I’m pushing it here.) I realize it may very well be that our outing or event of the week is equally as boring as pureed food, nevertheless, I will share with you a piece of our life outside of the kitchen. 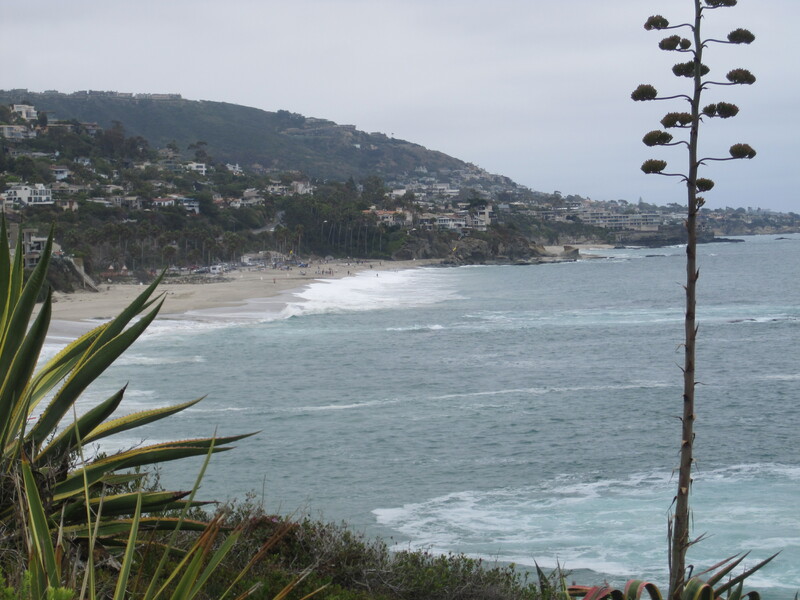 Last Wednesday, we were still experiencing drizzly, gray, and cold June-Gloomy weather but we bundled up and decided to take a stroll along the Laguna Beach coast, just in front of the Montage Resort. 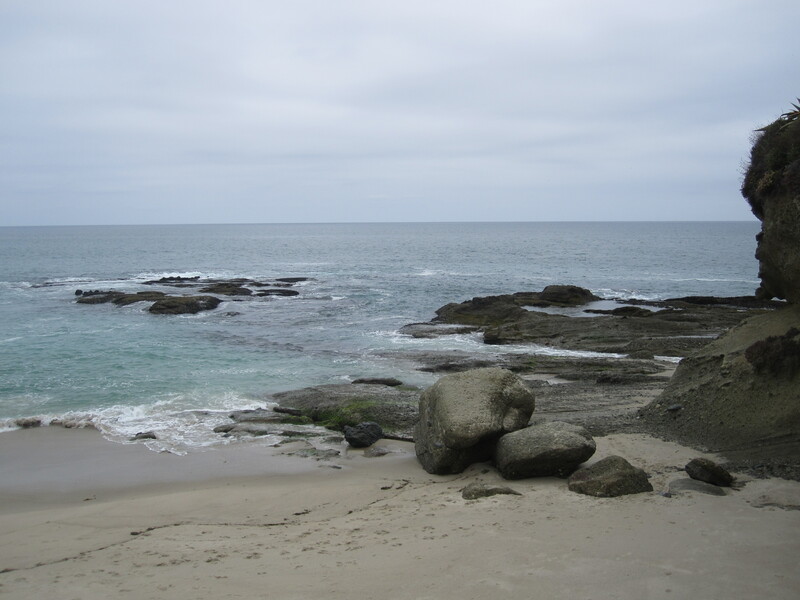 Here, the ocean water is a beautiful aqua color, there are tide pools and best of all, there is a nice descending path that is stroller accessible from the top of the bluff down to the sandy beach. On this day, it was high-tide and there were occasional strong waves but the water was clear. 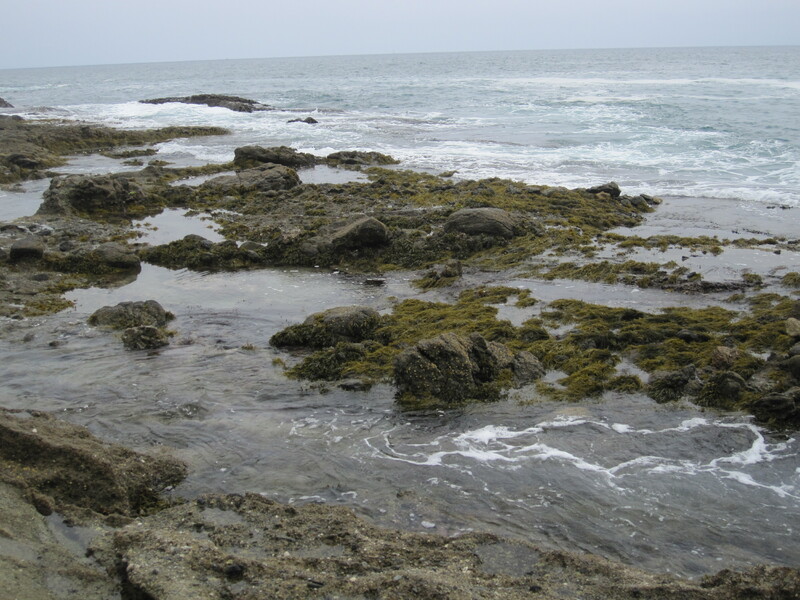 The majority of the tide pools were underwater and inaccessible but there were a few that housed tiny fish, crabs and little shell fish. 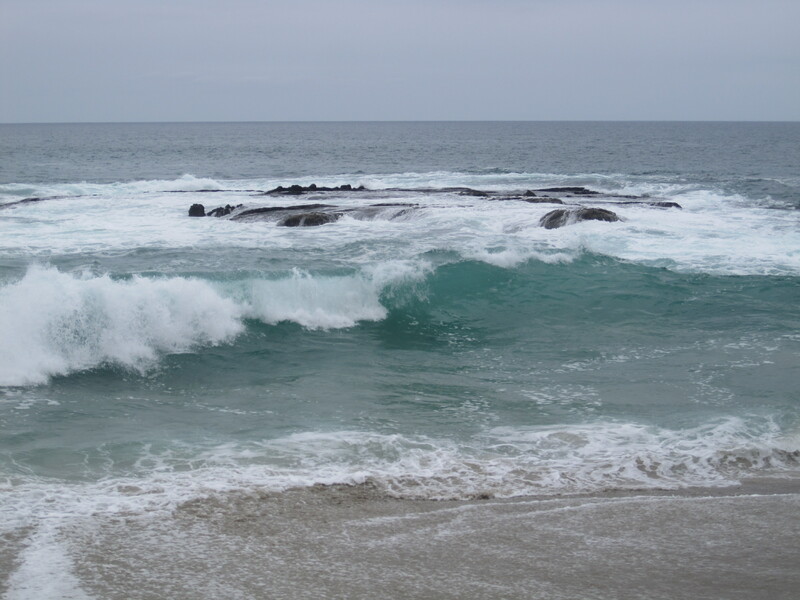 Although the skies were gray and overcast, the air was fresh and clean and the rhythmic sound of the crashing waves was very soothing. Bebe E and I sat on a rock and watched the ocean waves for a while. 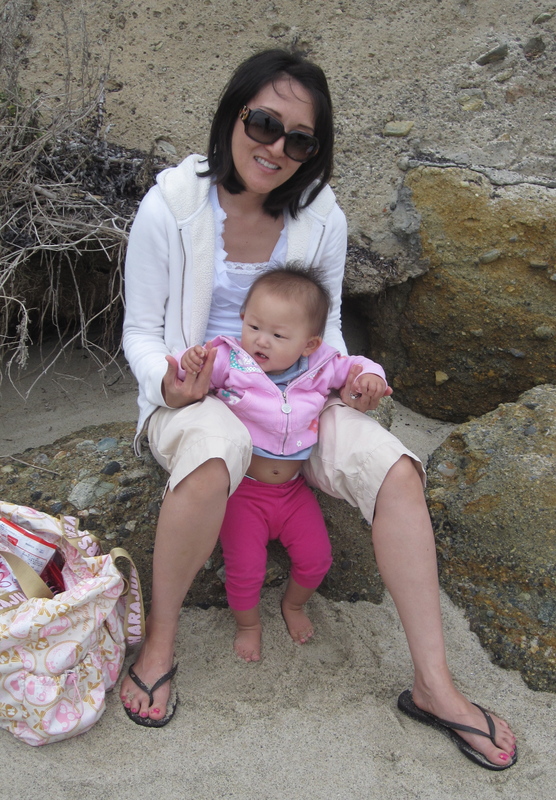 Then she got antsy and wanted to crawl on the sand but I wouldn’t let her. Instead, I allowed her to stand and play with the sand with her bare feet. Bebe E with her Bebe Mama hanging out at Laguna Beach. This is our view from the rock we were sitting on. Despite the gray skies it was still a very pretty day and sunny in it’s own way. 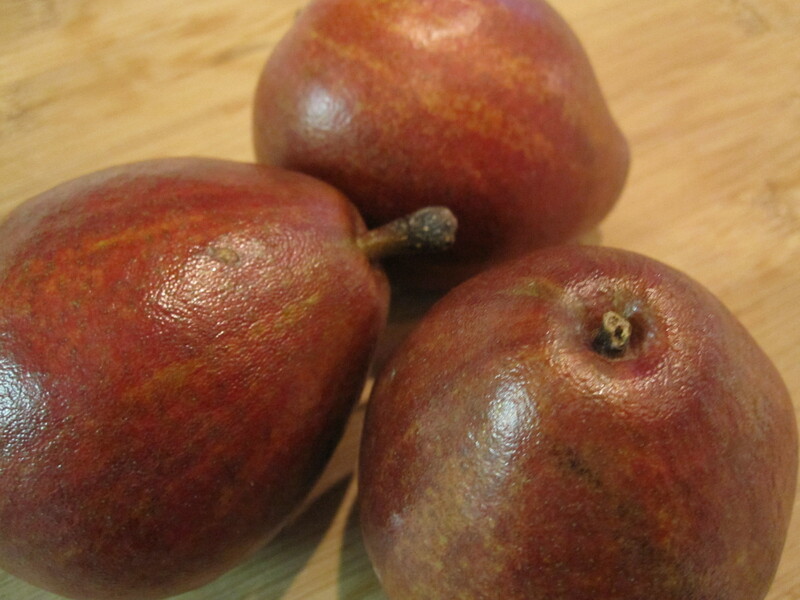 An interesting fruit that I came across in the Spring were Red Anjou pears. I saw these in the market and thought they were beautiful. I gave them my Bebe Mama smell test and they passed. They had a wonderful sweet aroma. (I have this funny habit of always having to smell fruit, and even vegetables sometimes, and sadly other things that are totally unrelated to food. My good friend Pepe can probably relate to this since she’s the same way.) So I bought a couple of these Red Anjous, along with some bartlett pears and prepared a fresh and sweet pear purée for Bebe E.
Similar to the preparation of my other pureed fruit and vegetables for Bebe E, peel and core fruit, cube, then steam or boil in water for 4 to 8 minutes until desired tenderness. Allow the fruit to cool, then transfer to a tall, wide cup and purée using a hand blender. Add reserved boiling liquid to pureed fruit to reach desired thickness. Scoop individual size portions into BabyCubes. These are freezer safe, microwaveable and dishwasher safe. They are one of the most convenient baby products that I’ve purchased and highly recommend them. 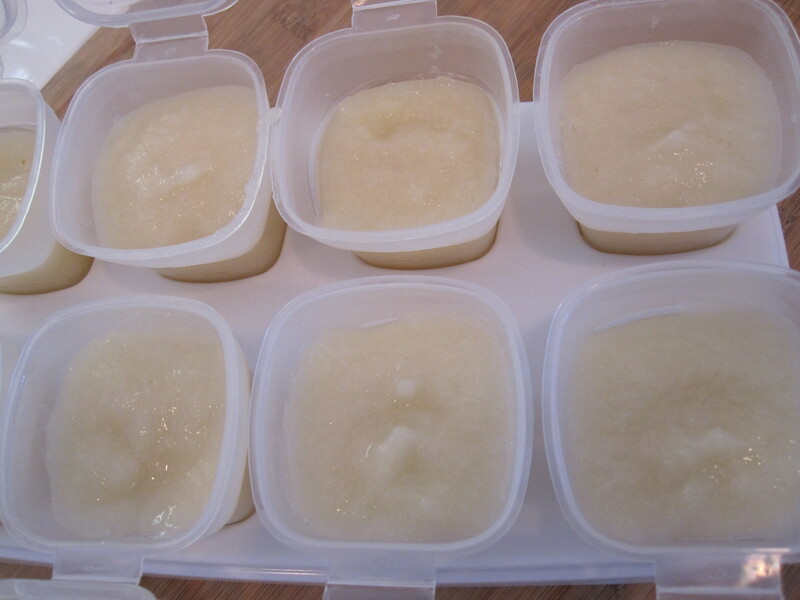 Store pureed pear in the fridge for up to 3 days and in the freezer for up to 3 months. Bebe E love-love-loved this pear purée because it was so sweet. She also liked to eat this when it was partially frozen (like a slushy) and icy cold because it must have been soothing for her aching gums that were working so hard to grow her tiny teeth. One of the things that I started to make for Bebe E when she was about 7 months was puree “mixes” to introduce her to more complex flavors. One of the first mixes that I made for her was an apple – pear puree. Either a mix of cut apples and pears are cooked together, or if you already have homemade apple sauce and pear puree on hand, feel free to mix these together prior to feeding your little one. Personally, I preferred the apple – pear puree mix for Bebe E over the straight pear puree because it was less sweet. Another puree mix that Bebe E likes is carrot – apple – pear puree. I usually just defrost frozen homemade carrot puree, applesauce and pear puree that I stored in the freezer in BabyCubes and mix them together for Bebe E in a bowl. This entry was posted in 1st Foods | 6 Months, 7 to 9 Months, Baby's Food, Travel | Out & About and tagged homemade baby food, pear puree by Judy | Bebe Love Okazu. Bookmark the permalink. Thank you! That’s so funny – I know THE show! Aw, what a cute picture of you and Baby E! I’m glad you’re posting all the baby foods that you make – they might come in handy someday. Thank you! I highly recommend motherhood. :) It’s a wonderful experience. Awww. She’s so cute. I almost miss those days when I would make my son baby food… He loved anything fruity. Wasn’t as into green food. Funny how it’s the same now! When he got a little older and was eating solids, I got one of those Munchkin food mills (you can also use a ricer, but they are bigger and you have to rice a larger quantity), and I would grind whatever we were eating (within reason). It was a real handy tool! Glad you are enjoying motherhood!! I love it too. Bebe E loves anything fruity too. She has a sweet tooth, just like her mommy. I wonder if I’m a bad mom for just feeding my 11 1/2 month old really chunky foods. I still chop things up as much as possible, but I stopped pureeing her food a while ago because she seemed to prefer chewable foods versus mushy foods. She seems OK, though. I think she just wants to eat grown-up food. Have discovered your internet site via google the other day and absolutely like it. Continue the truly great work.